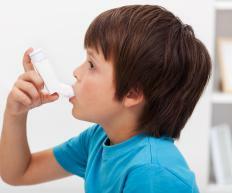 People are more likely to develop asthma if moisture has entered a home. An ice dam is a wall of ice that collects on the edge of a roof and keeps melting snow from being able to drain. The water that is prevented from draining can enter the home and damage ceilings, walls, and insulation within the house. An ice dam forms after a snowfall occurs, even if only one to two (2.5 to 5.1 cm.) inches of snow accumulates on the roof. Eventually, heat from the attic warms the roof and melts the snow. The melted snow then runs down the top of the roof until it arrives at a colder section, such as the gutters. Soon, the snow re-freezes, ultimately causing an ice dam. The worst ice dams are usually caused by heavy snowfall and frigid temperatures. Icicles hanging from a home's gutters is a sign that an ice dam is forming on the roof. If the situation is not corrected, the home can suffer extensive damage. A professional should be contacted in order to remove ice dams since trying to eliminate them can cause serious personal injury and roof damage. The professional contractor will often use a push broom or roof rake to remove the snow from the top of the house. Either of these tools is used to carefully pull the snow down the slope of the roof. The broom or rake is never dragged across the roof, as this can cause damage to the shingles or other parts of the roof. The professional contractor will then make channels through the ice dam so that the water located behind the snow can drain from the roof. A better way to prevent an ice dam situation is to increase the level of insulation on the ceiling and roof of the house, as this eliminates the loss of heat. To combat the formation of ice dams, ceilings should be built air tight so that warm air is not permitted to flow into the attic. Houses with skylights, recessed lights, roofs with complex designs, and heating ducts located within the attic increase the risk of an ice dam forming on the roof. People who own their own homes should take the proper precautions to prevent formation of ice on the gutters because mold and mildew can grow in a house where moisture has entered. As a result, people living inside the home are more likely to develop respiratory problems such as asthma. If water begins to leak inside the house because of ice dam formation, it is important to thoroughly dry any damp areas of the home. This will discourage the growth of mold and mildew. What is a Roof Snow Rake? How Should I Drive in the Snow? What are Some Snow Activities? What are Different Types of Snow Removal?